Kudos to Dr. Michael Dawson who was elected to the Royal Society of Canada’s College of New Scholars, Artists and Scientists. 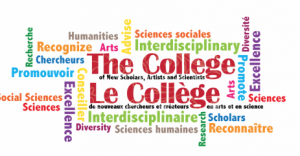 The college is Canada’s first national system of multidisciplinary recognition for the emerging generation of intellectual leadership. This was written by walhain. Posted on Thursday, September 18, 2014, at 3:54 pm. Filed under Faculty News. Bookmark the permalink. Follow comments here with the RSS feed. Both comments and trackbacks are currently closed.